How many times have you wished for a pocket-sized multimeter? How about a mini microcontroller-based testing rig? Have you ever dared to dream of a device that does both? Multiduino turns an Arduino Nano into a Swiss Army knife of portable hacking. It can function as an analog multimeter to measure resistance, voltage drop, and continuity. It can also produce PWM signals, read from sensors, do basic calculator functions, and display the health of its rechargeable battery pack. Stick a 10kΩ pot in the left-side header and you can play a space shooter game, or make line drawings by twisting the knob like an Etch-A-Sketch. Be sure to check out the detailed walk-through after the break, and a bonus video that shows off Multiduino’s newest functions including temperature sensing, a monophonic music player for sweet chiptunes, and a virtual keyboard for scrolling text on the OLED screen. [Danko] has a few of these for sale in his eBay store. They come assembled, and he ships worldwide. The code for every existing function is available on his site. More of a maximalist? Then check out this Micro-ATX Arduino. AlphaGo is the deep learning program that can beat humans at the game Go. You can read Google’s highly technical paper on it, but you’ll have to wade through some very academic language. [Aman Agarwal] has done us a favor. He took the original paper and dissected the important parts of in in plain English. If the title doesn’t make sense to you, you need to read more XKCD. [Aman] says his treatment will be useful for anyone who doesn’t want to become an expert on neural networks but still wants to understand this important breakthrough. He also thinks people who don’t have English as a first language may find his analysis useful. By the way, the actual Go matches where AlphaGo beat [Sedol] were streamed and you can watch all the replays on YouTube (the first match appears below). If you want to take good photographs, you need good light. Luckily for us, you can get reels and reels of LEDs from China for pennies, power supplies are ubiquitous, and anyone can solder up a few LED strips. The missing piece of the puzzle is a good enclosure for all these LEDs, and a light diffuser. [Eric Strebel] recently needed a softbox for some product shots, and came up with this very cheap, very good lighting solution. It’s made from aluminum so it should handle the rigors of photography, and it’s absolutely loaded with LEDs to get all that light on the subject. The metal enclosure for this softbox is constructed from sheet aluminum that’s about 22 gauge, and folded on a brake press. This is just about the simplest project you can make with a brake and a sheet of metal, with the tabs of the enclosure held together with epoxy. The mounting for this box is simply magnets super glued to the back meant to attach to a track lighting fixture. The 5000 K LED strips are held onto the box with 3M Super 77 spray adhesive, and with that the only thing left to do is wire up all the LED strips in series. But without some sort of diffuser, this is really only a metal box with some LEDs thrown into the mix. To get an even cast of light on his subject, [Eric] is using drawing vellum attached to the metal frame with white glue. The results are fairly striking, and this is an exceptionally light and sturdy softbox for photography. Breadboards are a great way to get started with electronics, they can remove the need for soldering which saves time for beginners who are still getting to grips with the basics of electricity, and they allow quick and easy changes to be made without the risk of melting components. However, they do require the stripping of a lot of hook up wires. While these are readily available off-the-shelf, [Stuart] decided a better solution was in order. The project starts with a set of standard hand-operated wire strippers. A lasercut acrylic frame is then built, with a series of motors and gears to handle the transport of the wire to be stripped and to open and close the jaws of the wire strippers. Wire is fed in, stripped, fed further, stripped again, and then finally cut. The process then begins anew. The machine is quite pleasant to watch in action, with a series of motors and limit switches helping to control the mechanism. It’s a great way to populate kits that require plenty of hookup wire without having to resort to the more common pressed-on jumper terminals that dominate the post-Arduino era. For context’s sake, this build is from the distant past, circa 2009. Plans to recreate it are available on Thingiverse. Video after the break. Given this is the future, perhaps you’d prefer your wires laser-stripped instead? We’re suckers for miniaturization projects. Stuff anything into a small enough package and you’ve probably got our attention. Make that something both tiny and useful, like this 5-volt to 3.3-volt converter in a TO-220 sized package, and that’s something to get excited about. It’s a switch mode power supply that takes the same space as a traditional linear regulator. Granted, the heavy lifting in [Kevin Hubbard]’s diminutive buck converter is done by a PAM2305 DC-DC step-down converter chip which needs only a few supporting components. But the engineering [Kevin] put into this to squeeze everything onto a scrap of PCB 9-mm on a side is impressive. The largest passive on the board is the inductor in 0805. Everything else is in 0603, so you’ll be putting your SMD soldering skills to the test if you decide to make this. Check the video after the break for a speedrun through the hand soldering process. The total BOM including the open-source PCB only runs a buck or two, and the end result is a supply with steady 750-mA output that can handle a 1-A surge for five seconds. We wonder if a small heatsink tab might not help that; along with some black epoxy potting, it would at least complete the TO-220 look. [Kevin]’s Black Mesa Labs has a history of turning out interesting projects, from a legit video card for Arduino to a 100-watt hotplate for reflow work that’s the size of a silver dollar. We’re looking forward to whatever’s next — assuming we can see it. Almost a really bad day in the woods. Like most accidents, it happened in an instant that seemed to last an eternity. I had been felling trees for firewood all afternoon, and in the waning light of a cold November day, I was getting ready to call it quits. There was one tiny little white pine sapling left that I wanted to clear, no thicker than my arm. I walked over with my Stihl MS-290, with a brand new, razor sharp chain. I didn’t take this sapling seriously — my first mistake — and cut right through it rather than notching it. The tree fell safely, and I stood up with both hands on the saw. Somehow I lost my footing, swiveled, and struck my left knee hard with the still-running chainsaw. It kicked my knee back so hard that it knocked me to the ground. In another world, that would likely have a been a fatal injury — I was alone, far from the house, and I would have had mere minutes to improvise a tourniquet before bleeding out. 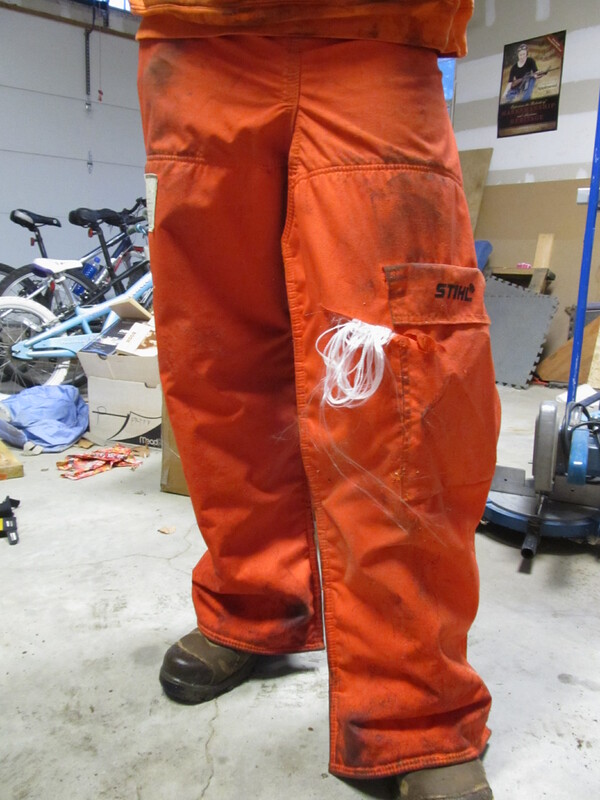 But as fate would have it, I was protected by my chainsaw chaps, full of long strands of the synthetic fiber Kevlar. The chain ripped open the chaps, pulled the ultrastrong fibers out, and instantly jammed the saw. I walked away feeling very stupid, very lucky, and with not a scratch on me. Although I didn’t realize it at the time, I owed my life to Stephanie Kwolek.